Ford Motor Company is looking squarely to the future: that’s the very public message they sent as Jim Hackett takes over as the company’s president and CEO. With tech companies like Google Apple, Uber and not the least, Tesla, continuing to dabble in an industry traditionally associated with “The Big Three” (General Motors, Ford, and Chrysler), Ford needs to speed up its vision of the future in order to adapt to the vastly new automotive landscape. And it seems they have found the man to lead them in Hackett. 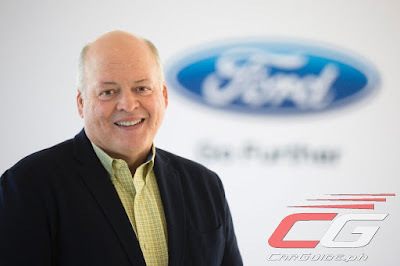 Hackett served as the Executive Chairman of Ford Smart Mobility, a forward-thinking division dedicated to autonomous vehicles and new forms of personal mobility like ride-sharing services. Hackett’s promotion to Ford’s top post cements the company’s commitment to continue on that path. In fact, one of Hackett’s first tasks would be to show that they’re not behind in the development of autonomous cars, but at par not just with General Motors, but with Tesla and Google too. A relative outsider in the auto industry, Hackett is close to being billed by those in Ford as the “next Alan Mulally”, a nod to the visionary man who brought Ford back to fighting form after tiptoeing so close to bankruptcy. Like Mulally, a former Boeing executive, Hackett has almost no car business experience. Instead, he led Steelcase, a Michigan-based furniture maker for 20 years. There, he showed off his leadership, steering the furniture maker through hard times while also adapting the company to meet the needs of tech company workers (Open Space concept, anyone?). Ford hopes that he’ll also transcend the auto industry the same way; the same way Mulally did, and with it, be willing to challenge long-held practices as well. Mulally, who famously turned down a federal bailout in 2008 and returned Ford to profitability, is probably the biggest cloud that hung over outgoing President and CEO Mark Fields. Though Fields launched a slew of solid products, expanded their performance business, and refined the company’s infotainment systems during his three year tenure, he didn’t articulate high level goals as well as Mulally did. Yet, Hackett is inheriting a solid foundation set by Fields. A veteran of the company for 28 years, Fields was the first one to announce the company’s transformation from an automobile company into a mobility company. He mapped out a path of opportunity that Hackett is now expected to continue. Of course, Ford’s big push towards a future of mobility shouldn’t come at the expense of their traditional business. In the end, the numbers have to be good, and sadly for Ford, they haven’t been for some time (at least for their home market). This is something Ford hopes to correct with this management shakeup. They aim to speed up the decision making process including the use of technologies such as three-dimensional printing, advanced robotics, and even artificial intelligence in Ford’s businesses. Like other carmakers, Ford may re-think underperforming areas of its business such as the passenger car segment and even dropping unprofitable business units where it’s struggling while pushing profitable markets such as Asia-Pacific to the forefront. As the auto industry becomes more fluid to changes in consumer behavior, something more often seen in tech companies, so can their fortunes turn so quickly. Hackett’s promotion to Ford’s top post serves as a wake-up call not just for the company, but for all automakers that are lagging behind the technology race. As the automotive sector, let alone the entire transportation sector expecting a transformation in the next decade or so, Ford cannot afford to be behind the curve. Now, the world will find out if Hackett can finally bring Ford’s future vision to fruition. ^"Hackett’s promotion to Ford’s top post serves as a wake-up call not just for the company, but for all automakers that are lagging behind the technology race"
IMO, it depends on which dealership and SA. As for me, my dealership and SA is above average. I scheduled my PMS on line a week before and a follow up call a day before the schedule and no problem at all. It took 2 hours to finished the job.